We recommend using Chrome as your browser because it is optimized to work with Google Apps for Education. In addition to the default features, this page provides information to make browsing better! If you do not see the Apps Shortcut on your bookmarks bar or if you do not see your bookmarks bar, follow the instructions below. 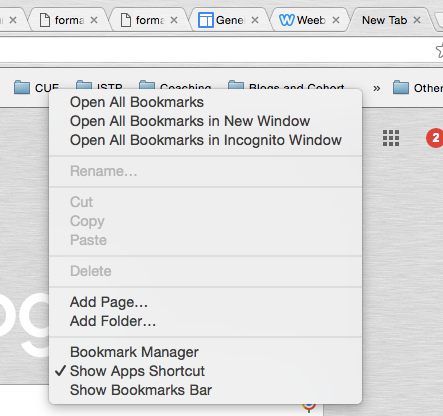 Open a New Tab (your bookmarks bar is always visible on a new tab). You will always see your bookmarks bar at the top of pages and have access to the Apps Launcher. Below are links documents in English and Spanish describing Chrome Extensions that are great to use with students and to save you time. You will also find instructions for logging into multiple accounts on the same computer. Click on the Three Bars icon to see your installed Extensions.